***Plan now to be here over New Year's! Cartagena is a blast during the holidays! 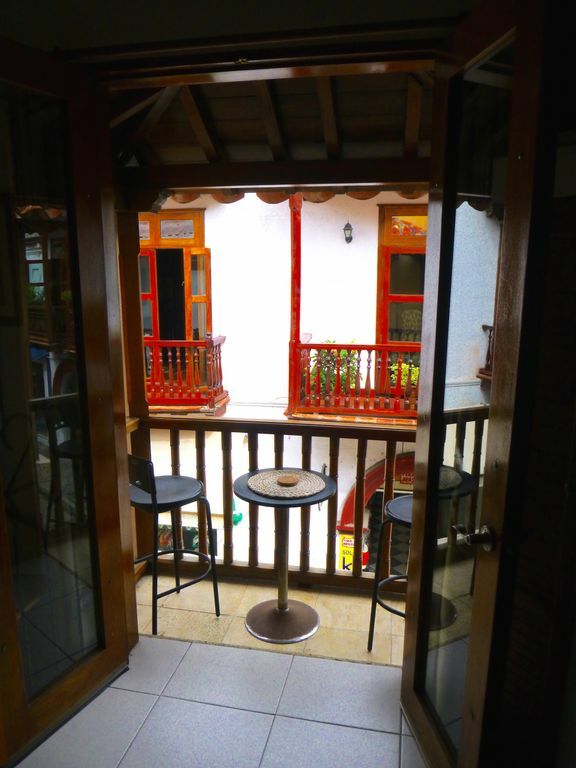 This one bedroom vacation rental apartment is in the historic center of Cartagena. It is located on vibrant Calle de la Moneda in the San Diego district and is a perfect holiday retreat for one to four persons. One of the most striking features of this apartment is its balcony that overlooks bustling Calle de la Moneda. It's a terrific perch from which to people watch or sip a cocktail in the evening! The apartment has a fully equipped kitchen with everything needed to cook yourself a savory meal. Energy efficient mini splits provides generous coolness on hot days. Other amenities include state of the art internet with a dedicated bandwidth, ceiling fans, cable tv in the living room and bedroom, and tile throughout. The apartment is large and the bedroom is situated far enough from the living room for seclusion and privacy if someone were to occupy the sofa bed in the living room. The bedroom is furnished with a double bed, wardrobe and a safe for valuables. The bathroom is large, beautiful and modern. There is hot water which is not available everywhere in Cartagena. Yasmina, our wonderful caretaker, will now do laundry for guests at a charge of 10,000COP ($3.50)/load. There is a laundry sack in each apartment. Please ask if you need extra linen, towels, iron and ironing board. Visitors to the Caribbean naturally flock to Cartagena. It's not just home to the largest Spanish fort in the Americas- more impressive than Campeche, San Juan, or Havana. It's not just the splendid walled city - designated a UNESCO World Heritage site in 1984. As much as anything it's the people and culture. Immerse yourself in Cartagena's captivating and colorful history. Visit the amazing naval museum and imagine yourself an adventurer or better, a buccaneer! Have our delightful concierge, Benjamin, arrange an enchanted back alley tour of the city that will have you begging for more stories of colonial intrigue. Wander and get lost in Cartagena's vibrant streets. Savor an empanada or tropical fruit juice from the many vendors that line the streets. Pay tribute at the Monumento a los Zapatos Viejos and then when you are good and tired, relax in your comfortable and cool apartment! Everything you need or desire is within short walking distance of your apartment: beautiful colonial buildings and plazas, cafes, pastry shops, terrific restaurants and bars, museums, the wall itself and the fort. A large supermarket, Exito, is just around the corner. The iconic ambassador of Colombian coffee, Juan Valdez, now adds his name to a chain of Juan Valdez Cafes, one of which is located just a block away. Calle de la Moneda is typically busy and crowded during the day, but wonderfully tranquil and peaceful at night. It is not necessary, nor is it recommended to have your own car in the Walled City! Walking is definitely the way to explore the area. Taxis abound and are very economical. Be sure to negotiate. You should be able to get around the walled city and surroundings for about 5000 pesos during the day and 6000 pesos at night. Catch a romantic horse drawn carriage to take you back to the apartment at night. Benjamin, our delightful, inimitable and ebullient manager, will be on hand to assist you with any and all of your needs. He does not live on the property, but is always accessible. He knows Cartagena like the back of his hand. We live in Dallas, Texas and have owned vacation rental properties for many years. I have always been in love with Latin American culture and minored in Spanish in college. When we went to Cartagena in 2011 we fell in love with the city and bought 3 modern, renovated apartments in the old walled city on Calle de la Moneda. In 2015 we bought the unique corner historic Los Balcones building and renovated it! We divide our time between Dallas, Cartagena and our other properties on Ambergris Caye, Belize. Old Cartagena is simply magical! We fell in love with the city and wanted to buy immediately. We were delighted and excited when this property became available. It is now wonderfully renovated and perfectly situated to explore the walled city. The balconies are fantastic and our 3 apartments make up the entire second floor of this building. It is very private. The property is in the heart of the Old Walled City on the lively street of Calle de la Moneda. It's very typical of Old Cartagena- beautiful colonial buildings, vibrant and bustling, no need for a car, within walking distance of every site imaginable. One of the perks of this property is that it is wonderfully tranquil at night. Bathroom is large, modern and gorgeous with beautiful clear shower stall and stone. Hot water! Could you be anyplace better situated than in the center of the Walled City of Cartagena?! You will never be bored! Ocean is just outside the city walls! The walled city of Cartagena is on the ocean! Just outside the old wall! Yasmina, our caretaker, will be available to do laundry for guests at a charge of 10,000COP per load. She will use a laundry bag labeled for each apartment making it hard to lose any of your laundry. After 3 days guests may have more towels. Please ask Yasmina. Unbelievable balconies in the Studio and One Bedroom Apartments overlooking the very vibrant Calle de la Moneda. People watch while having your coffee or a cocktail! Sorry! We're up a flight of stairs. Smoking allowed only on balcony and rooftop deck. The location of this apartment was great. We could walk everywhere. It was clean and had a wonderful balcony to take in the street life. Thank you so much for the great review! The balcony and location are definitely two of the studio's greatest assets. I am so happy that you had a wonderful stay and I hope you have the opportunity to come back! The apartment is nicely set up, clean with everything working well - the AC is strong and silent - the hot water is very much appreciated and all the lights etc work. The location is ideal for exploring, you are right in the heart of the old town. Expect some street noise during the day, vendors, lots of people walking and traffic - but at night it is quiet - no restaurants or clubs in the immediate vicinity. Benjamin the manager is very punctual and helpful - all in all a great choice. Thank you, Phillip, for the generous and thoughtful review! I am so glad you appreciated the apartment amenities and especially our wonderful manager, Benjamin. We couldn't do it without him. Because we are right in the heart of the Old City, there will certainly be noise during the day. I am glad that it was quiet at night which is my experience as well. The one bedroom is nice because the bedroom is located at the back of the apartment and away from the street. Thanks again for the terrific review. I hope you come back! It was just perfect: immaculate, the manager met me there precisely on time when I checked in, great convenient location, nice balcony to watch the passing scene. If I get back to Cartagena, I will definitely stay there again! Thanks for the wonderful review, Scott! Benjamin is a fantastic manager and the balcony is one of the terrific amenities of both the one bedroom and studio apartments. Great for people watching! I am looking forward to your return. First off I must say I stayed in the studio. I originally booked the 2 bedroom but due to scheduling conflicts Deb contacted and asked if I could change my dates. There were only 2 of us staying and I thought the studio would be sufficient. It is very, very small. A queen bed, one outdoor chair, two night stands. Very sparse. The street noise is constant from 6am-9pm. On top of that, this is a busy busy street with cars & locals that makes it is difficult to sleep. By day 3, I was ready to go somewhere else as I was trying to work and it was difficult to do in this loud confining space. The other apts look much larger with the bedrooms to the back. I do take responsibility for allowing myself to being switched to the smaller apartment that made my visit less than great. I always chose the best hotels when traveling, such as Four Seasons, Westin, overseas Marriott, Hyatt, etc. In Cartagena I wanted to try an apartment and stayed at the 2 bedroom unit. Pluses include: Clean, comfortable and attractively decorated apartment in the middle of the best area in Cartagena. Very short and easy walking distance to the best areas, including restaurants and shopping areas. The caretaker, Henry, was both effervescent and helpful and immediately resolved any issues (an A/C remote needed help). Cons include: Could have supplied a flat sheet on the beds rather than just fitted with blanket. Electricity was off for 1 hour one day, and 7 hours for another, although not the fault of the caretaker or owner. Cable TV reception not very good. In summary, I would recommend your stay at this apartment. Manager Henry was the best part of the apartment. We stayed a week in the studio apt. It was just ok, but the manager Henry was great, very helpful when there was a problem. Çartagena was great to visit. Lots to do and some wonderful testaurants. The three apartments are centrally located in the historic walled city within easy walking distance of all attractions. The location is down the street from the University of Cartagena and around the corner from Plaza Fernandez de Madrid.